In classical times, an important Greek unit of length, in concept the distance from the tips of the fingers to the elbow (so it belongs to the cubit family of units). An interesting and almost unique functional test of the length of an ancient unit occurred when enthusiasts built and rowed a reconstruction of a Greek trireme.¹ Vitruvius says that the distance between oars (the interscalium) was 2 pechoi. 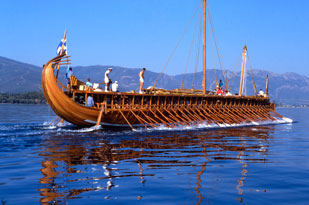 The ship, the trieres Olympias, was built taking 1 pechus = 44.4 centimeters. © John Coates, The Trireme Trust. Reproduced by permission. The trireme Olympias under oar in 1987. “Sea trials...demonstrated, even after taking into account the likely stature of ancient Athenian oar-crews, that the room of 0.888 m is insufficient to allow an oar-crew to develop its full potential in acceleration and endurance.”² Further research showed a value of 49.1 cm, which would have been more efficient for the rowers, was also more accurate historically. 1. J. F. Coates, S. E. Platis, and J. T. Shaw. The Trieme Trials of 1988. Ancient Greek measures of length in nautical contexts. Antiquity, volume 65, pages 298-305 (1991). Last revised: 22 July 2010.